I am a new Brittain Fellow in Digital Pedagogy at Georgia Institute of Technology, where I teach a 21st Century version of First-Year Writing. This class focuses on the WOVEN curriculum, a broader curriculum of communication than that of traditional writing classes, and heavily emphasizes technological tools to develop those communication skills. You might think by this disclosure that I am a digital native / well-adjusted digital immigrant, comfortable with all aspects of new technology, able to rattle off app names and affordances and build multi-use platforms. Not true. I’m comfortable with a number of pretty basic and commonly used apps, but I don’t even know what a multi-use platform is. Or even if that is the right name. So how did I get here? That was me, clammy-palmed, desperate to get away. So how did a former computerphobe come to teach at a place that emphasizes technology and be (somewhat, with flashes of panic) comfortable with it? The fear and confusion began in 4th grade, the first time I ever saw a computer: 10 year old me at a new school with newfangled greenscreened machines. Each box under the screen had a little metal plaque which said “Apple IIC” on it. I think it was the Roman numerals that scared me most. We didn’t have anything with roman numerals on it at my house except for classical records. I learned that computers were Important. They weren’t just tools; they were expensive, holy, and magic objects, capable of who knew what then. They required elaborate rituals involving a soft piece of cloth that Mrs. Bundy collected at the end of the period in a plastic pouch, rituals that if performed incorrectly, would cause suffering. I feared that the Oregon Trail game we played in the computer lab at the end of typing practice just kept going on without us, and Cousin Bill would die in a gruesome and vividly blue river-wagon accident. This fear decreased only slightly as I grew up. My mom hoped that I might have better proficiency than her at typing (she paid people to type her papers in college), but didn’t know that computers were the future. She also passed on to me a somewhat diminished version of her confusion and anxiety about new technology. In 5th grade, she bought me a brand new electric typewriter. In my family and my neighborhood in the mid-80s, electric typewriters were expensive and fancy. The expense and fanciness of computers were unfathomable, and we couldn’t imagine ever having one, or why someone would own one. 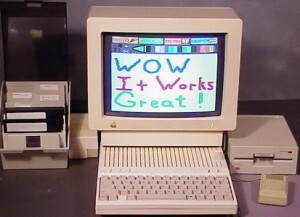 I remember marveling at a friend’s computer skills in 7th grade; we worked on a group project at his house, and I watched him type, enter commands, and sift through floppy disks with incredible speed. I was confused and a little frightened. It only occurred to me to be jealous later when I got home and looked at the electric typewriter. It suddenly seemed so plain. I knew at that point that computers would be a part of my educational future, but had no idea how. In high school, we were sometimes taken to the computer lab (with brand new Mac Classics) to work on papers, or were allowed to work on the computers alone during lab hours, but the sense I got from this was that computers were Special tools used at Special times for Special reasons, not everyday objects. The only people who didn’t seem to feel this way were the guys who spent every spare moment in the lab. They were nice enough, but I wanted to be outside, and I didn’t understand their compulsion. The sense that computers are fragile, moody, and vengeful things still comes to me at times; yesterday I had trouble understanding how to get all of my students onto one blog, and in my mind’s eye, I saw Uncle Bill’s feet slip closer to the blue, blue water. Computer anxiety is a real phenomenon, even among those in the privileged areas of business and academia, as shown in a recent study by Nikos Bozionelos . Given my early history with computers, I’m pleasantly surprised at how well I’m adapting (that is, not panicking) to the steep tech learning curve of the Brittain program. What I understand now is that my initial dread at learning a new app (will I break it, will things blow up, will things beep at me?) looks a lot like my students’ initial dread at receiving a new writing assignment. I’m happy to realize that in this case, I practice what I preach, which is to dive in and start somewhere, knowing now I can always go back and edit, or revise, or delete and start over. This doesn’t mean I’m no longer skeptical, or that I feel fully comfortable using all of the tech available to my classroom. It means that I have learned to take a breath and to tell myself that it will be ok. In my next installment, I’ll discuss what else this change means to my own teaching and learning prejudices and comfort. Well said, sister. Yet I have to say that, being six years ahead of you, my own fears of new technology were probably more intense. I wasn’t exposed to the machines until high school when my skills were fairly well established, and even then that exposure was intermittent at best. For years afterwards I actually got along quite well through college without having to use them, relying on “traditional” means of paper writing and information gathering. Only recently, meaning over the last couple of years, I have managed to quell a great deal of my fears and use the technology for communication and writing. But the fears do linger, not because of the possibility of the machines beeping, zapping or blowing up, but because of the high speed in which technology is advancing and the growing dependency upon it. And I am quite stubborn. I continue to hand write everything before submitting it to the digital ether of these machines and still use an “old fashioned” dictionary to check the spelling. So, out of curiosity and not to begin any kind of debate, how many students do you have who are my age or older, and how will you assure them that the machines and their digital environments can be trusted? I don’t think I have any non-traditional or older students at Gtech this semester, though I have had them at other schools where I have worked. The non-traditional students who were comfortable with technology / computers seemed to be so because of jobs or previous schooling. Those who were not digitally literate needed more help, so, depending on the school’s resources, I could always take a little time to show them how to do something, but I would more often refer them to the schools’ IT or tutoring centers. However, the strength or availability of that help varied widely from school to school, as did the students’ time and access. Luckily, here at Gtech, if I have a traditional first year student who does have some digital anxiety, there is a great amount of official help from the library and other sources, as well as unofficial help in the form of fellow students who can teach them. I do not (please comment, GTech people who do know) know whether there is a dedicated service at GT for non-traditional students, or students who don’t have a basic level of digital literacy.